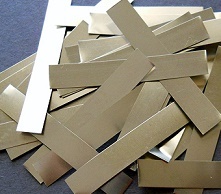 Package of 20 Solder Tabs for Sub-C and C size batteries. Made of Nickel-Tin; easy to solder to. Tab size: 3/8" wide x 1 1/2" long. Solder Tabs for AA-size batteries - 20 pcs. Made of Nickel-Tin; easy to solder to. Dimensions: 5/32" wide x 0.85" long. Solder Tabs for AAA size batteries - 20 pcs. Made of Nickel-Tin; easy to solder to. Tab size: 5/32" x 11/16". Solder Tabs for Sub-C and C batteries - pkg of 20 pcs. Made of Nickel-Tin; easy to solder to. Tab size: 1/4" wide x 1 1/4" long. 100 pcs Solder Tabs, AA size. Made of Nickel-Tin. Easy to solder to. Dimensions 5/32" wide x 0.85" long. 100 Solder Tabs for AAA size batteries & smaller. Made of Nickel-Tin; easy to solder to. Tab size: 5/32" x 11/16".